Hey there! It's Jenny again from J. Van Allen Photography. This is our second week in the Picture This tutorial. We're taking those baby steps towards using our camera in manual mode! Don't be scared. Just a little refresher from last week we talked about exposure (the process of capturing light with your camera to produce an image on film/digital sensor). and talked about the first half of the equation regarding f-stop/aperture (the circular mechanism inside the camera that allows light into your camera). Today, we're going to talk about the second half of the equation, shutter speed. Shutter speed controls the ability to blur or stop action in a photograph. It also determines how long the film/digital sensor is exposed to light. the shorter amount of time the shutter is open (exposed), the less light enters the camera. (resulting in a picture with the action frozen). Remember the overall exposure is all about light. Shutter speed is measured in seconds. Fast shutter speeds are measured in fractions of a second (ex. 1/500, 1/1000, etc.) while the slower shutter speeds are considered anywhere from 1 to 1/60. Here are some examples of a fast shutter speed freezing the water spray in motion. Here's an example of a slow shutter speed. Notice how there's this blur around my son. It seems he's going super fast, when really he's just scooting on by. 1.Set your camera to Shutter Priority (TV for Canon and S for Nikon) Shutter priority will allow you to control the shutter speed and the camera will determine the appropriate based on your scene. 4. Find a subject to photograph (this time we're going to be brave and pick people...!) 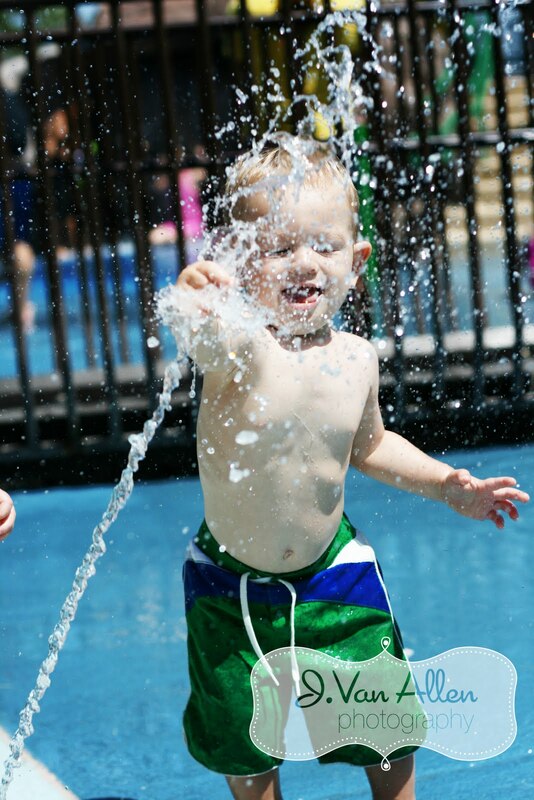 Let them run around jump in the air, play in water. 5. Take pictures like crazy (starting off a slow shutter speed such as 1/60 and moving up to a high shutter speed like 1/1000). 6. Download pictures. 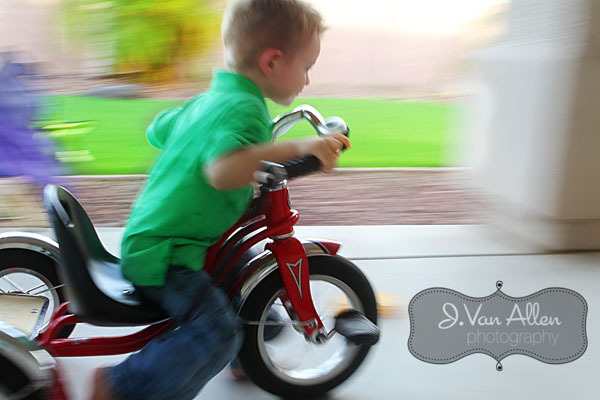 Are your getting that motion blur on slower shutter speeds and freezing actions with the fast shutter speeds? Okay stay with me next week we'll put it all together and also talk about ISO. Loving this workshop, thank you so much for sharing your awesome tips. I've always wanted to take those amazing frozen water shots, but couldn't quite get all of the elements together. I'm so excited and will definitely give it another try.